In order to understand how much has always been common this bird, it would be sufficient to read what had declared by the end of ‘800 Giacomo Puccini, when, by the end of a hunting trip to the coot by netting on the Lake Massaciuccoli, Tuscany, did sit with his hunting friends in some tavern in front of a good glass of red wine to recount its adventures. So it occurred that the local cooks invented the recipe of the Puccini’s coots. The description was then resumed by Figuier in one of his books on the end of the XIX century. At the end the hunters also enter those masses of corpses, of moribunds and of wounded, everyone collecting them in great quantity in a large number of big baskets …. In fact, once ended the time of nidification the coot gathers in flocks at times very consistent and shelters on the Alpine lakes, in the plain swamps, along the rivers but also in the public gardens of big cities where, mixed with ducks and other aquatic birds, begs for the food from the citizens moved to pity due to the inclement winter. Yet at this time it keeps a very humble behaviour towards the other birds, trying to steal them some morsels without showing the usual misbehaviour it distinguishes it from all other birds. As a matter of fact, the coot has a very bad temper with all, quarrelsome beyond belief, unwelcome by its winged or not neighbours, poorly tolerated by the conspecifics. Somewhat like the moorhen (Gallinula chloropus), bird belonging to the same family but much more humble and more timid in the behaviour even if it also does not represent a model of goodness. 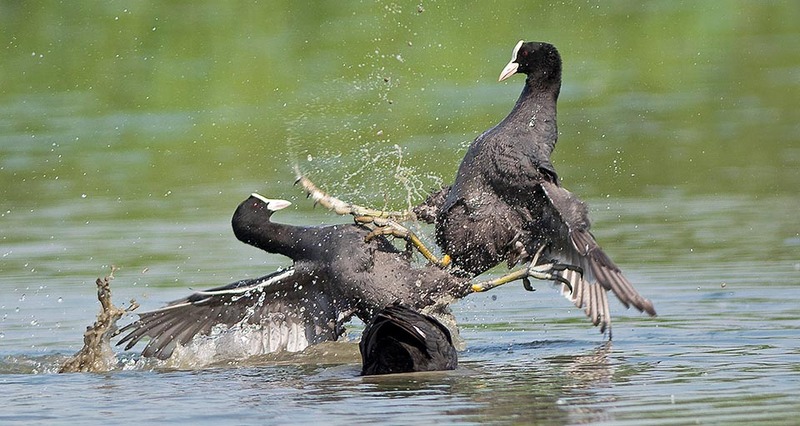 The coot spends most of its time, in particular during the period of nidification, in fighting ceaselessly whoever passes close, engaging in fierce and very noisy struggles. One of its usual ways for frightening the opponents or even intruders absolutely not interested of its problems, is that of stamping loudly on the surface of the water causing high and fluffy sprays, in the middle of which its shape gets bigger making it appear as a more dangerous menace than what actually is. Not satisfied, here it is leaving without any warning, in a crazy race on the water head down and with squeaky voice, towards the intruder that unaware and calmly relaxed at tens of metres far away, gets himself suddenly facing an approaching hurricane. However, if the danger does not stray than it does not hesitate in attacking the opponent with all possible vehemence, using its long legs and scratching the opponent with its long nails in a raging fight accompanied by acute and screaming cries. It attacks indifferently coypus and big rats but also ducks, any kind of limicolous and herons. In fact, it has been often noticed that in order to make a clean sweep in its territory, it does not hesitate in entering the colonies of the Black-winged stilts (Himantopus himantopus) destroying the nests and finding there, besides a sadistic pleasure, also an unusual meal with their eggs. 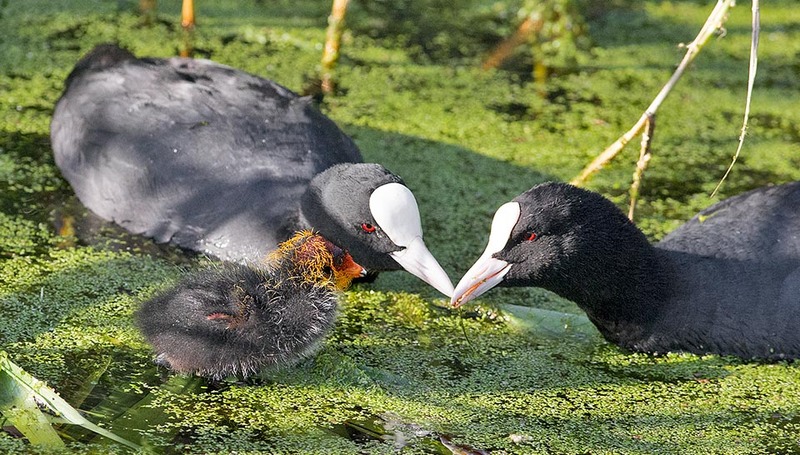 The Coot (Fulica atra Linnaeus, 1758) belongs to the order of the Gruiformes and to the family of the Rallidae and alongwith the moorhen is to be considered as one of the most common birds in the world. The etymology of the scientific name gets probably origin for the genus Fulica, from the Latin “fuligo, fuliginis” = dark, sooty, confirming then with the term atra the same concept. It is well known in Italy and finds locally rather particular and interesting vernacular names confirming its presence in all the national territory. Folghe, foega, sfoio, pulun, priton and many others. 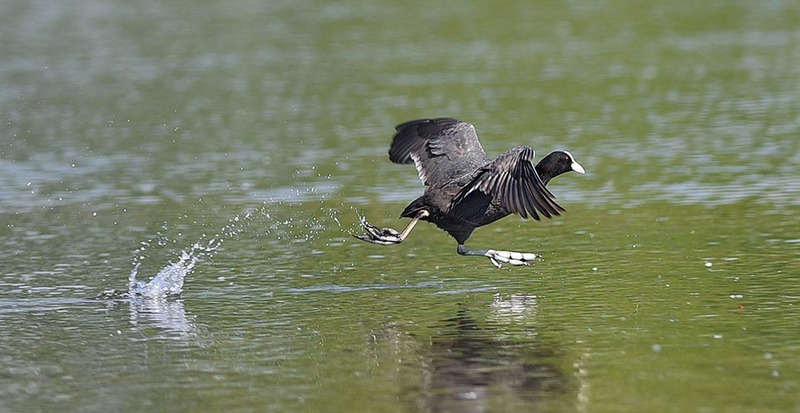 In Europe is onomatopoeically Coot in English, Bläßhuhn in German, Focha in Spanish, Foulque macroule in French, Folaga in Italian e Galeirão comum in Portuguese. 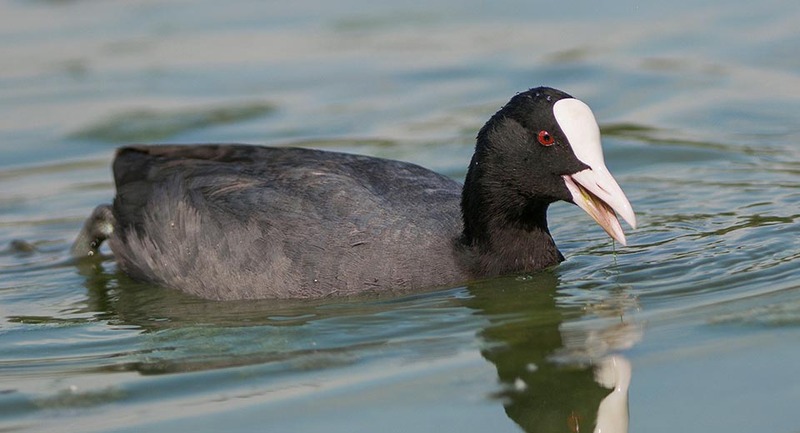 The coot has a very vast range covering various continents. It is present in Europe, in North Africa and in almost all Asia from Siberia up to Australia. In Europe it is well diffused and present in great number in the suitable habitats. Also in Italy it is found at any latitude and in the Mediterranean islands, in particular during the double passage when flocks of a certain consistency take form. 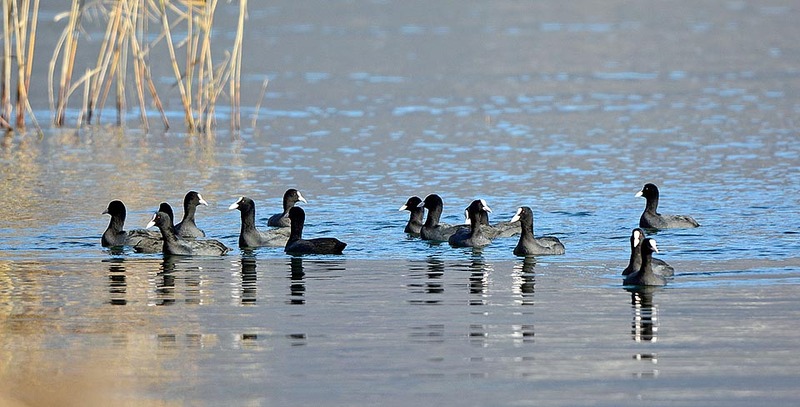 The migration is conditioned by the decrease of the temperatures in the nidification areas that obliges the coots to reach locations where the water streams or the swamps are not subject to icing. For this reason, the first nearest suitable areas in the southwards migrations see the gathering by the first cold of immense flocks of these birds that then progressively decrease during the occurrence of new cold spells. 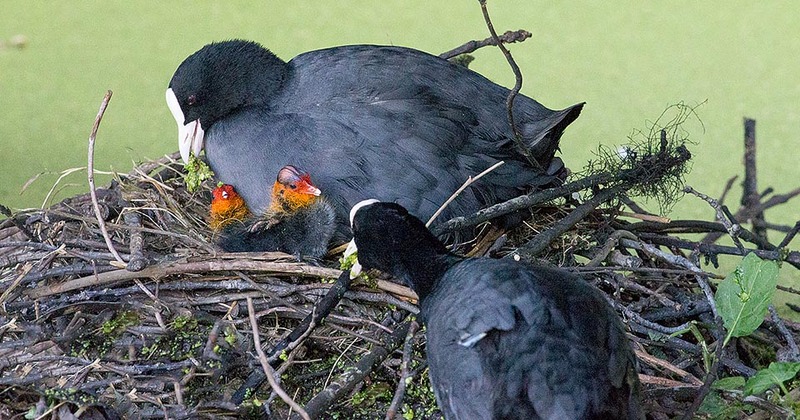 The habitat of the coot varies depending on the season even if essential is the presence of water and of a well thick and vast riparian vegetation. It loves a lot the averagely deep waters where it can dive to pick up algae on the bottom or to look for the preys it nourishes of. It is not present in the dry and mountainous areas nor even in dense woods. 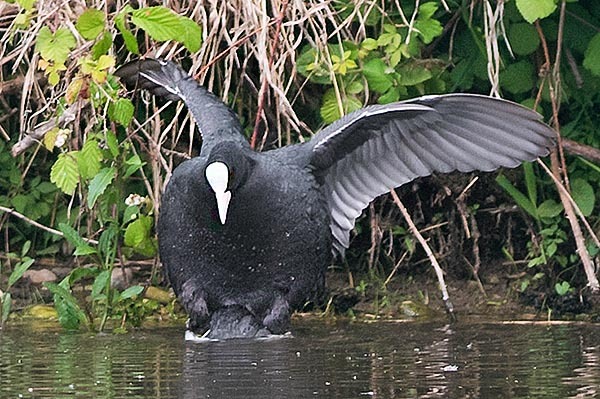 Rarely the coot gets to the ground unless if gotten greedy by some delicacy sighted on the nearby meadow or for stretching its legs for some minutes and for grooming the feathers while keeping the feet dry. Its life passes permanently in the water where it very easily floats and where it finds all what is necessary for its life. In the water it nourishes, hides, mates, nidifies and breeds its progeny. 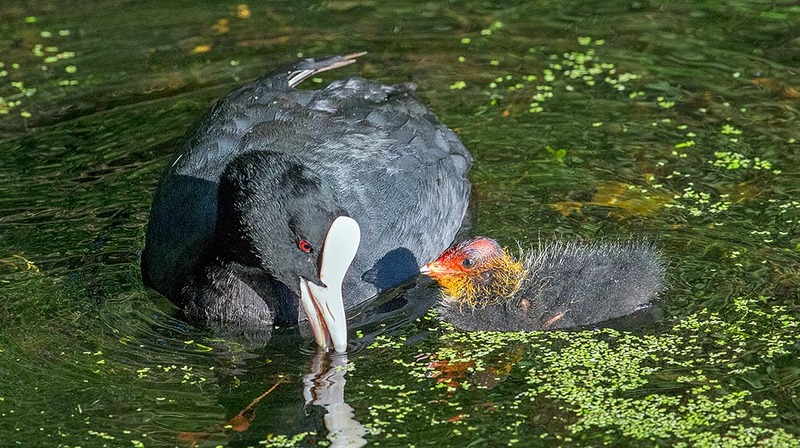 Water is an essential element for the presence of the coot whether it is a vast swamp densely covered by phragmites or by dense marshy herbs, or an artificial small pond or an abandoned quarry and, nowadays, even a small lake in a city park with an islet and four reeds. Two are the components that guarantee its presence, the existence of thick vegetation with the base immersed into the water, where to hide and nidify and open spaces where to feed and perform the usual fights. These habitats are those usually frequented when in the wild state, but not those in the city or in anthropized environments where its way of life has drastically changed. 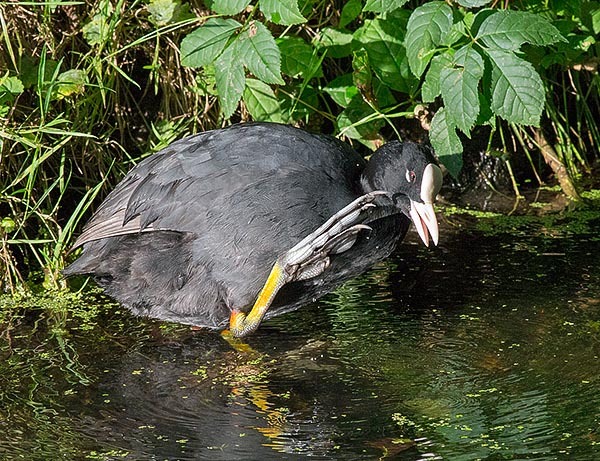 Here we observe a partial taming of the coot, a resignation to the human presence, the relaxation due to the absence of traditional predators and even the absence of direct competitors. In the city the coot does what it hardly would do in the open country. In the middle of the day we can see it sunbathing on the edge of the small lake a few metres far from a bench or building the nest in an open location and brooding indifferent to those sitting nearby or nourishing the chicks under the eyes of all bystanders. This would never be done in its natural habitat! Or, better, it would never be able to escape seen the various dangers it is subjected. As it is well reiterated in its scientific name, the coot is black. A slate black when reflexed by the sun but unquestionably dark when seen from far away and discernable from the livery of the moorhen (Gallinula chloropus) only due to the white beak and the white plate marking its front. This shield is visible even from far away rendering it easy to distinguish from the bright red one of the moorhen. Very few are the particulars for distinguishing the sexes, the male often shows a vaster frontal shield and the female has a slightly bigger size. The eyes are of a nice dark bright red as proof of the ability to see easily also in the dark. The young, abandoned the nidifugous down, quickly assume the subadult livery that much resembles to the parents’ one even if the white frontal shield is absent. Also the black of the livery is more opaque and tending brown. The legs are very long and robust, greenish and equipped with very long fingers having strong and sharp nails. 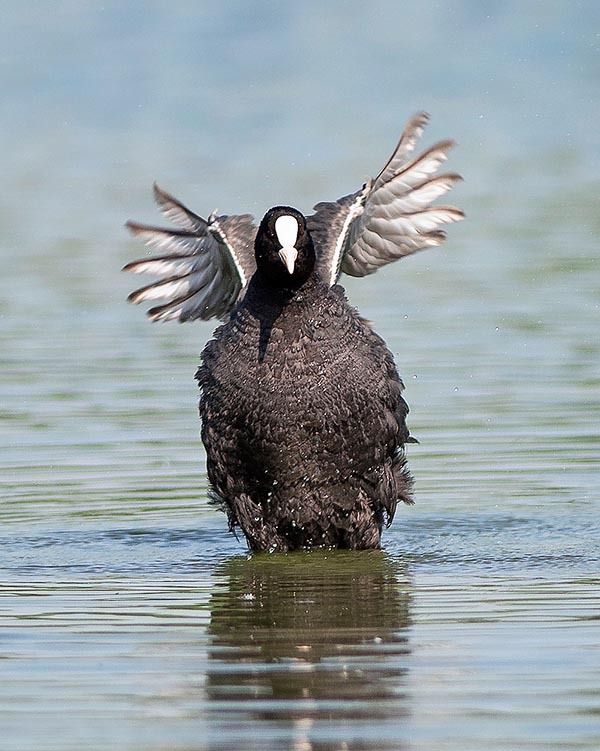 The coot fingers are characteristic and quite different from those of its family members. 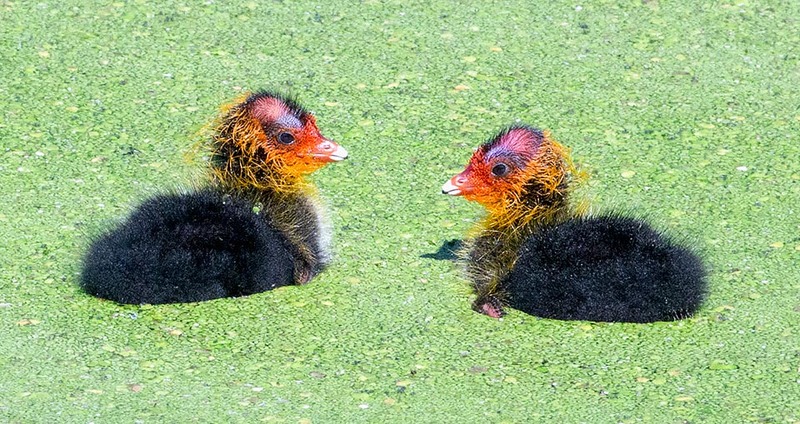 They are semipalmated and consequently suitable for walking on the floating weeds creating pads that facilitate the support of its weight as well as for swimming quickly when necessary. These are double independent appendages on each phalanx that close on themselves when the leg is brought forward and open when moved backwards, creating that palmate area necessary to give propulsion to the movement. 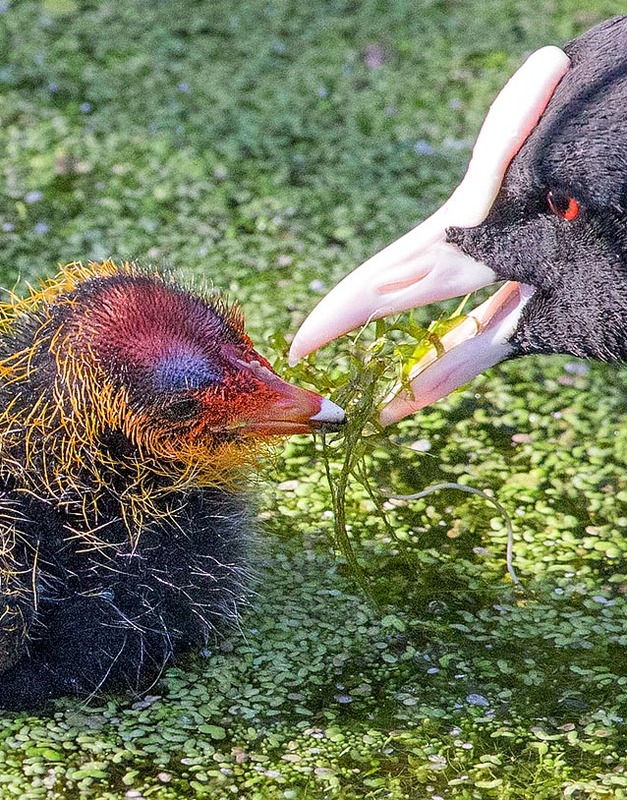 The coot is a bird with a stocky body, compact, grouped on itself, with robust neck and hooked beak it uses for tearing off the weeds it eats, from the roots floating on the surface as well as on the bottom of the water body even at some metres of depth. This capacity of immersion is eased by the lobed fingers that, used for this purpose, give the necessary thrust for plunging a body having a strong buoyancy and that, otherwise, would be impossible to plunge. Proof of this is that the moorhen, that having non webbed feet, would never be able to imitate it. The coot has a weight of 600/800 g, the greatest for the female, a length of 45 cm and wingspan of 70 cm. The wings are short and stubby and inadequate for allowing a starting when departing enough to allow them to start on a vertical flight. 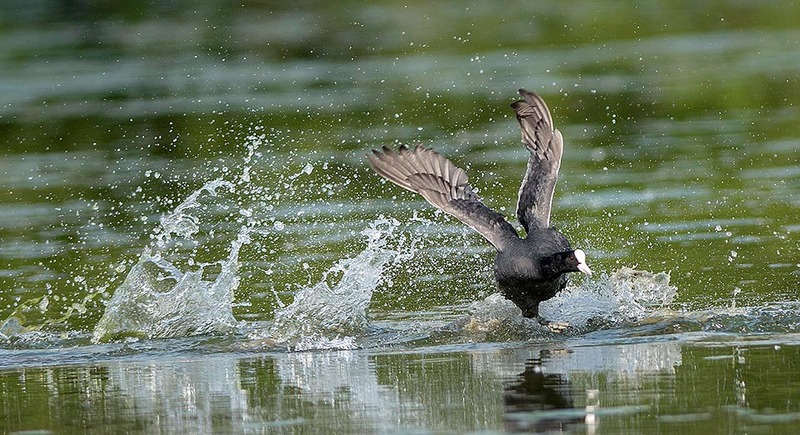 In fact, the coot in order to take off needs a crazy run-up on the water of at least a fifteen metres after which it is able to glide and get away from the surface. When flying, initially keeps the legs hanging down as typical to the rallids, once reached the height required folds them like the landing gear of an airplane upon the take off. 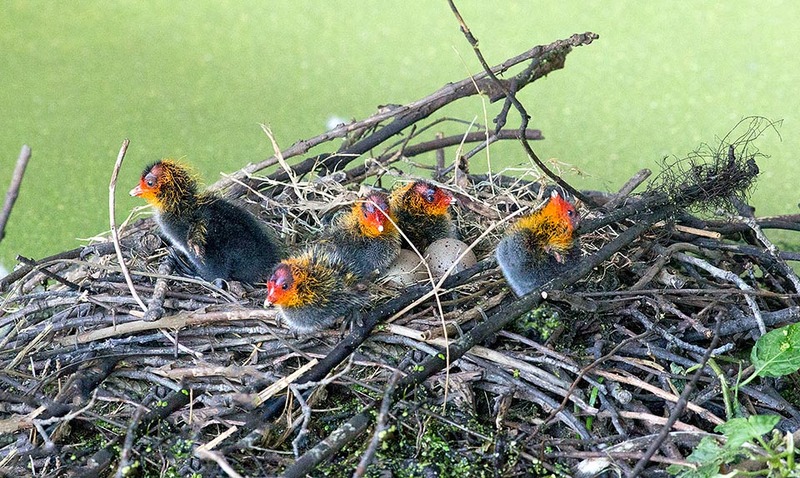 The coot is a good reproducer and may nidify twice a year but even more can lay considerable quantities of eggs per each single brood. Up to 12 eggs, of good size, with a weight over the 40 g, white with reddish dotting that are brooded by both parents for about 3 weeks. This situation is however counterbalanced by a high juvenile mortality but also by a discrete reduction during the harsh winters. As typical to the birds nidifying on the ground, besides from above, they are subject also to the predation by the animals frequenting the habitat where they live. The coot lives on the water and the danger often comes rightly from this element in a sudden and unexpected way and against this the adults nothing can do. It’s enough that in the small lake is present a Pike (Esox lucius) and here are the first poor victims, the chicks of aquatic birds who, follwing the parents during their first swims, are suddenly sucked by an invisible aquatic monster. A wince, a short water surge and a chick has disappeared. Then from above, do lie in wait the Western marsh harriers (Circus aeruginosus), the no less voracious Hen harriers (Circus sp. ), the ubiquitous Grey herons (Ardea cinerea) but also the Grey crows (Corvus cornix), Long-eared owls (Asio otus) and the Little owls (Athene noctua). The nest is built by both partners inside the reed bed and can float and resist to the sudden raise of the level of the water or on brambles or suspended branches over it or exceptionally high on a pollarded trunk but always close to the water surface. The base is formed by bulrushes and dried up weeds piled untidily to form platforms even half a metre tall, often used again during the year as well as in the following season. The young are nidifugous and come to life with a blackish down that leaves partially the head bare rensering them similar to subjects with an early juvenile baldness. They are born almost at the same time and leave the nest a few hours after the hatching even if the same is used for spending the night. Then, they depend on the parents for some more weeks though already independent, till when they reach a size even greater than the parents. The activity of the coot does not stop with darkness as it is endowed of a good night vision and of eyes particularly suitable for the purpose. Its main food consists in small fishes, tadpoles, molluscs and aquatic crustaceans but also of aquatic vegetation and algae it collects on the surface or directly on the bottom of the basin up to some metres of depth. It also eats small water snakes, nestlings of other birds and eggs taken from the nests hidden in the vegetation surrounding its territory. We have already mentioned the hunting to which this bird is subject in any corner of its territory even if it has a hard and a fairly bad tasting flesh. Although it boasts these very bad virtues, the species is usually hunted and the flesh usually consumed, perhaps giving preference to the particularity and the intrigue of the type of hunt than to the pleasure of the tasting. Although subject to strong collection, the species is not considered as at risk and, conversely, its populations show a progressive and constant increase.